Voter suppression, legalized bribery, the destruction of unions, poverty, racism, a partisan Supreme Court and much, much more â€“ we are witnessing the deterioration of American democracy right before our eyes. Itâ€™s time to fight back. 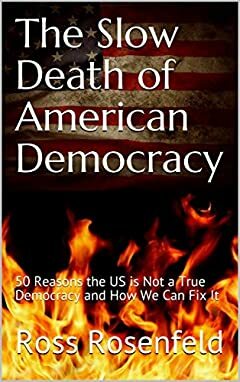 In this book youâ€™ll find fifty problems with American democracy laid bare, encompassing everything from the Electoral College to the disproportionate make up of the Senate to our extremely skewed tax code to shadow organizations with enormous influence over our government. If youâ€™re a liberal, if youâ€™re a progressive, if youâ€™re part of the Resistance, this book will give you the intellectual ammunition you need to combat the extremist Republican Party and the injustices weâ€™re seeing all around us. We can no longer sit back while conservatives take names off of voting lists and add names to prison rosters. Some of the information youâ€™ll find this book will truly shock you. But we can change things. It begins by defeating the lies from the other side. Letâ€™s get started.